WISDOM has a wonderful support network for you to be part of. From your facilitator to your PAC to your local support group there is a range of support opptions available to WISDOM families. Your facilitator is your homeschooling resource and is available to answer your questions throughout the year. Click here for biographies and contact information for each of WISDOM's facilitators. The Parent Advisory Council (PAC) is a group of homeschooling parents. As well as helping set WISDOM's direction and policy they are also available to support and help other families in their homeschooling journey. 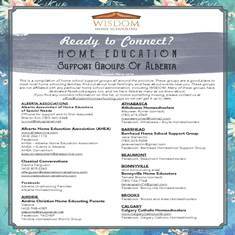 To contact a member of WISDOM's Parent Advisory Council near you, click here. There are also local support groups located throughout Alberta. Most of these are regional co-operatives of families who arrange activities and meetings together. Find our most current list, here. Another resource available to you is the Home School Legal Defense Association. Click here for their website.